Lard is fat from a pig, in both its rendered and unrendered forms. It is a semi-soft white fat derived from fatty parts of the pig, with a high saturated fatty acid content and no trans fat. Rendering is by steaming, boiling, or dry heat. The culinary qualities of lard vary somewhat depending on the origin and processing method. At retail, refined lard is usually sold as paper-wrapped blocks. Many cuisines use lard as a cooking fat or shortening, or as a spread similar to butter. It is an ingredient in various savoury dishes such as sausages, pâtés, and fillings, and it is particularly favored for the preparation of pastry because of the "flakiness" it provides. In western cuisine, it has ceded its popularity to vegetable oils, but many cooks and bakers still favor it over other fats for certain uses. Lard has always been an important cooking and baking staple in cultures where pork is an important dietary item, with pig fat often being as valuable a product as pork. During the 19th century, lard was used similarly to butter in North America and many European nations. Lard remained about as popular as butter in the early 20th century and was widely used as a substitute for butter during World War II. As a readily available by-product of modern pork production, lard had been cheaper than most vegetable oils, and it was common in many people's diet until the industrial revolution made vegetable oils more common and more affordable. Vegetable shortenings were developed in the early 1900s, which made it possible to use vegetable-based fats in baking and in other uses where solid fats were called for. Upton Sinclair's novel The Jungle, though fictional, portrayed men falling into rendering vats and being sold as lard, and it generated negative publicity. By the late 20th century lard began to be considered less healthy than vegetable oils (such as olive and sunflower oil) because of its high content of saturated fatty acids and cholesterol. However, despite its reputation, lard has less saturated fat, more unsaturated fat and less cholesterol than an equal amount of butter by weight. Unhydrogenated lard contains no transfats. It has also been regarded as a "poverty food". 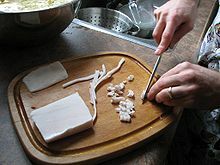 In the 1990s and early 2000s, however, chefs and bakers rediscovered lard's unique culinary values, leading to a partial rehabilitation of this fat among "foodies". Negative publicity about the transfat content of the partially hydrogenated vegetable oils in vegetable shortening has partially driven this trend. Chef and food writer Rick Bayless is a prominent proponent of the virtues of lard for certain types of cooking. Lard can be obtained from any part of the pig that has a high concentration of fatty tissue. The highest grade of lard, known as leaf lard, is obtained from the "flare" visceral fat deposit surrounding the kidneys and inside the loin. Leaf lard has little pork flavor, making it ideal for use in baked goods, where it is valued for its ability to produce flaky, moist pie crusts. The next-highest grade is obtained from fatback, the hard subcutaneous fat between the pig's back skin and muscle. The lowest grade (for purposes of rendering into lard) is obtained from the soft caul fat surrounding digestive organs, such as small intestines, though caul fat is often used directly as a wrapping for roasting lean meats or in the manufacture of pâtés. Lard may be rendered by two processes: wet or dry. In wet rendering, pig fat is boiled in water or steamed at a high temperature and the lard, which is insoluble in water, is skimmed from the surface of the mixture or separated in an industrial centrifuge. In dry rendering, the fat is exposed to high heat in a pan or oven without water (a process similar to frying bacon). The two processes yield somewhat differing products. Wet-rendered lard has a more neutral flavor, a lighter color, and a high smoke point. Dry-rendered lard is somewhat browner and has a caramelized flavor and has a lower smoke point. Consumers wanting a higher-quality source of lard typically seek out artisanal producers, or render it themselves from leaf lard or fatback. Because of the relatively large fat crystals in lard, it is extremely effective as a shortening in baking. Pie crusts made with lard tend to be flakier than those made with butter. Many cooks employ both types of fat in their pastries to combine the shortening properties of lard with the flavor of butter. When used without qualification the word 'lard' in English generally refers to wet-rendered lard, which has a very mild, neutral flavor as opposed to the more noticeably pork-flavored dry-rendered lard, or dripping. Dripping sandwiches are still popular in several European countries—Hungarian zsíroskenyér ("lardy bread") or zsírosdeszka ("lardy plank"), and German "Fettbemme", seasoned pork fat. Similar snacks are sometimes served with beer in Poland, Czech Republic, and Slovakia. They are generally topped with onions, served with salt and paprika, and eaten as a side-dish with beer. All of these are commonly translated on menus as "lard" sandwiches, perhaps due to the lack of familiarity of most contemporary English native speakers with dripping. 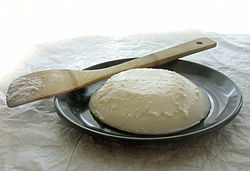 Attempts to use Hungarian zsír or Polish smalec (both meaning "fat/lard") when British recipes calling for lard will reveal the difference between the wet-rendered lard and dripping. In Taiwan, Hong Kong and Macao, as well as in many parts of China, lard was often consumed mixed into cooked rice along with soy sauce to make "lard rice" (豬油拌飯 or 豬油撈飯). And in Japan, back loin (fatback) lard is frequently used for ramen, creating a thick, nutty, slightly sweet and very hearty dish. In Poland lard mixed with fruit, usually chopped apple, and spread on thick slices of bread, is often served as a starter. Rendered lard can be used to produce biofuel and soap. Lard is also useful as a cutting fluid in machining. Its use in machining has declined since the mid-20th century as other specially engineered cutting fluids became prominent. However, it is still a viable option. 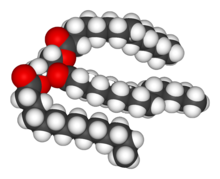 Lard and other animal fats were formerly used as an anti-foaming agent in industrial fermentation processes such as brewing; there, animal fats have been superseded by polyethers. ^ a b c d Ockerman, Herbert W. (1991). Source book for food scientists (Second Edition). Westport, CN: AVI Publishing Company. ^ a b Alfred Thomas (2002). "Fats and Fatty Oils". Ullmann's Encyclopedia of Industrial Chemistry. Ullmann's Encyclopedia of Industrial Chemistry. Weinheim: Wiley-VCH. doi:10.1002/14356007.a10_173. ISBN 3-527-30673-0. ^ a b "The Real Thing: nothing beats lard for old-fashioned flavor" by Matthew Amster-Burton, The Seattle Times, September 10, 2006. ^ a b "Don't let lard throw you into a tizzy" by Jacqueline Higuera-McMahan, San Francisco Chronicle, March 12, 2003. ^ a b "Light, Fluffy – Believe It, It's Not Butter" by Matt Lee and Ted Lee, New York Times, October 11, 2000. ^ "Heart-stopping moment for doctors as we're falling in love again with lard" by Sally Williams, Western Mail, January 5, 2006. ^ a b Helen Carter. "Lard crisis: mince pies threatened as supplies dwindle". the Guardian. ^ a b "Chefs prize it. The French love it. The Poles are hogging it. And now Britain's running out of it." by Christopher Hirst, The Independent, November 20, 2004. ^ Ockerman, Herbert W. and Basu, Lopa. (2006). Edible rendering – rendered products for human use. In: Meeker DL (ed). Essential Rendering: All About The Animal By-Products Industry[dead link]. Arlington, VA: National Renderers Association. p 95–110. ISBN 0-9654660-3-5 (Warning: large document). ^ a b "Ask Cook's: Is Lard an Acceptable Shortening? ", Cook's Illustrated, November 2004. ^ "Armour: Lard, 64 Oz: Baking". Walmart.com. Retrieved 2012-08-13. ^ "Put Lard Back in Your Larder" by Linda Joyce Forristal, Mother Linda's Olde World Cafe and Travel Emporium. ^ a b "Make Your Own Lard: Believe it or not, it's good for you" Archived 2007-10-13 at the Wayback Machine by Lynn Siprelle, The New Homemaker, Winter 2006. ^ Julie R. Thomson, "10 Reasons You Should Be Cooking With Lard," HuffPost Taste, 28 April 2014 (Retrieved 5 October 2014). ^ a b c d e f g h The Culinary Institute of America (2011). The Professional Chef (9th ed.). Hoboken, New Jersey: John Wiley & Sons. ISBN 978-0-470-42135-2. OCLC 707248142. ^ Katragadda, H. R.; Fullana, A. S.; Sidhu, S.; Carbonell-Barrachina, Á. A. (2010). "Emissions of volatile aldehydes from heated cooking oils". Food Chemistry. 120: 59. doi:10.1016/j.foodchem.2009.09.070. ^ "Heaven in a Pie Pan – The Perfect Crust" by Melissa Clark, New York Times, November 15, 2006. ^ "Manteca "Colorá", tarrina 400g - fabricantes de embutidos, chacinas, venta de embutidos" (in Spanish). Angellopezsanz.es. 2009-01-18. Archived from the original on 2012-04-26. Retrieved 2012-08-13. ^ "ZURRAPA DE LOMO TARRINA 400 G - fabricantes de embutidos, chacinas, venta de embutidos" (in Spanish). Angellopezsanz.es. 2009-01-18. Archived from the original on 2012-04-26. Retrieved 2012-08-13. ^ Sanders, Michael S. (March 29, 2009). "An Old Breed of Hungarian Pig Is Back in Favor". The New York Times. ^ IMG_2116 by chrys, Flickr.com, September 16, 2006. ^ "Austrian Restaurant Guide" by Keith Waclena, February 18, 2000. ^ "The Biodiesel Bible" by Keith Addison, Make your own biodiesel (website).